Hey guys and welcome to my tutorial on stripping paint. 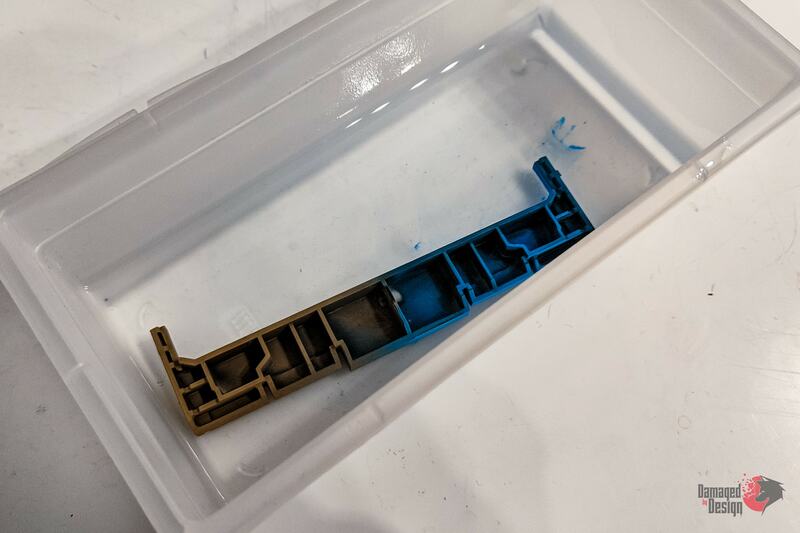 Removing paint from the kit is usually something we want to avoid. Sometimes, however, it just needs to be done – whether due to a mistake or the color combination we chose simply not working well. 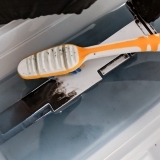 We can easily remove any kind of acrylic paint. 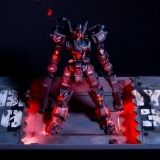 In this tutorial I’ll show you how to remove acrylic paint from your kit. 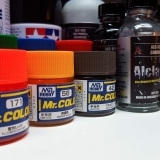 Whether it’s water-based acrylics like AK or AMMO, solvent-based like Tamiya, or even lacquer – Mr.Color C, Alclad and so on – the process is exactly the same. 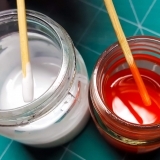 For this tutorial, I prepared two parts we’ll be stripping paint from. 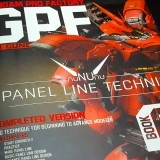 To begin with, I primed both of them using Mr.Surfacer 1500. I then painted the first one using Mr.Color GX6 Morrie Green, thinned with Mr.Color Leveling Thinner. 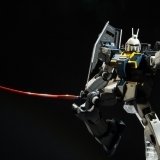 For the second part, I used Tamiya X-14 Sky Blue, thinned with their own X-20A, on one side, as well as AMMO’s A.MIG-073 Earth, thinned with water, on the other side. I feel this gives us a good sample size of various acrylics to showcase paint removal. 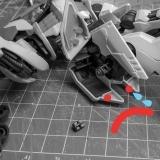 After painting, I left the pieces alone for about a month, while I worked on the Astaroth. At this point, they were as dry and cured as they were ever going to be. Now, onto the tutorial! 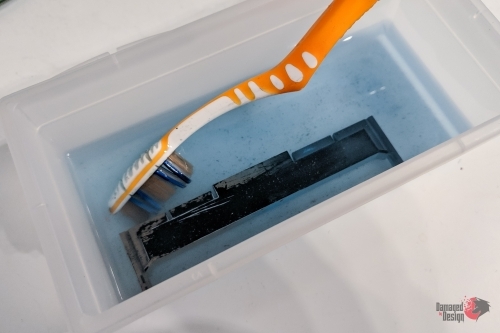 I’ll show you two methods of stripping paint – first using an ultrasonic cleaner, then with a humble toothbrush. There are quite a few options when it comes to stripping paint, but my favorite one is definitely 99% IPA (isopropyl alcohol). Not only it easily strips all kinds of acrylic paints (including lacquers), but it’s also safe on plastic, even if you leave them soaking for days. Imagine you set up to remove paint from some parts, drop them in IPA and suddenly friends call you to grab some beers. One thing leads to another and you suddenly find yourself on a deserted island halfway across the world. By the time you get back you traveled through 15 different countries barefoot, you look like a hermit, sporting a wizard beard, your family doesn’t recognize you. You come home, the IPA has evaporated weeks ago… and all the parts are still completely fine. Ok, that escalated quickly. Point is, IPA is perfectly safe for plastic. 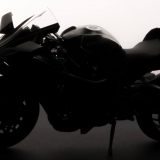 Now, depending where you live in the world, you might need to do some searching to buy it. In the US you can probably find 91% IPA, which will work just as good, in most of the bigger grocery stores. There’s also 70%, commonly known as rubbing alcohol, but it’ll take much longer (probably couple hours) to get the job done. In other parts of the world, it might not be as easily available, so try searching for it on the Internet. 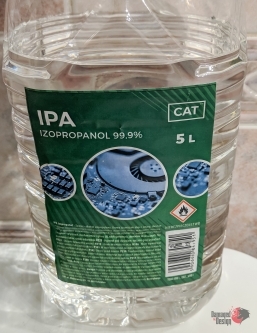 Here in Poland, I actually get my 99% IPA from online stores selling car cosmetics. Now, a quick warning. I’ve heard some stories of IPA actually damaging resin. 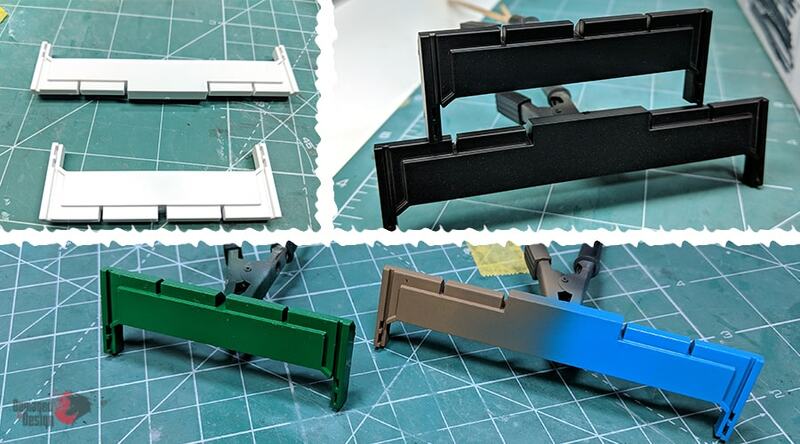 I can’t really comment on it, since I didn’t need to do any paint stripping on resin so far, but just to be safe you might want to look at other options, like industrial purple degreasers, if you need to remove paint from resin parts. 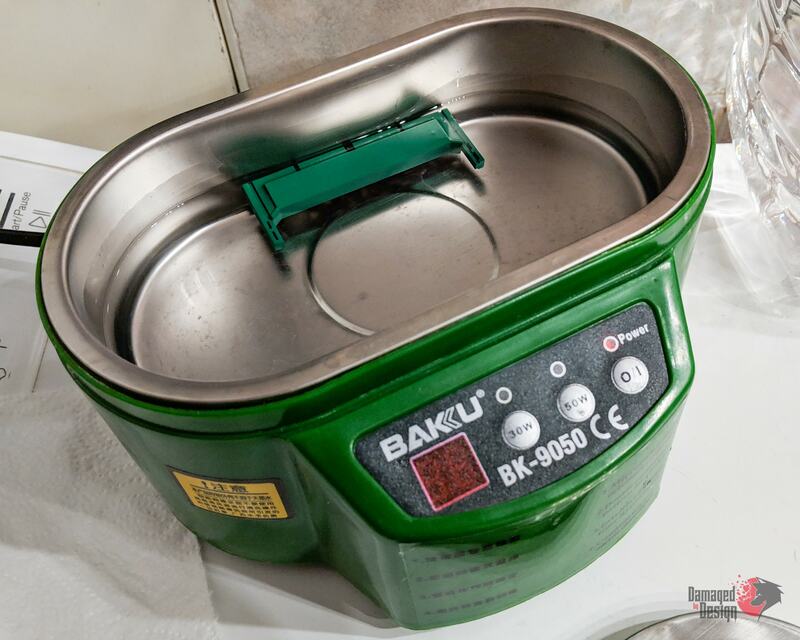 Ultrasonic cleaner is an amazing tool and I highly recommend having one in your workshop. 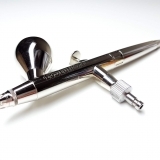 It’s great for washing parts after building, cleaning your airbrush and – obviously – removing paint. While it is an investment, it’ll quickly pay for itself in time saved. As you can see, I have a cheap cleaner from China. 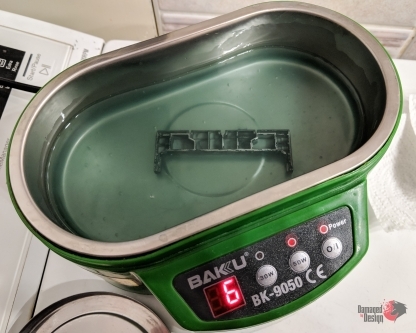 It works great – better than some of the branded ones (if you ever see Vallejo ultrasonic cleaner, give it a wide berth). 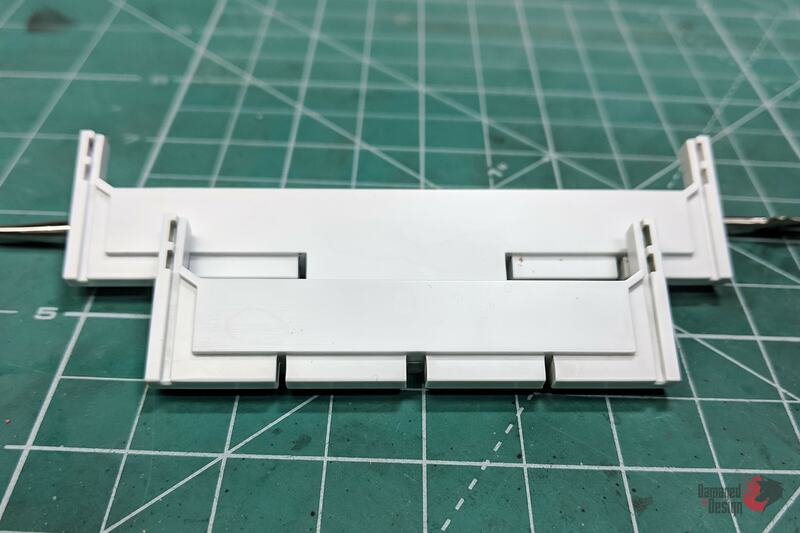 This model is more than enough for our purposes. We’ll begin by filling the bowl with IPA, then we simply dump our parts into the bath. We want at least some of our parts to sit at the bottom, so they transfer vibrations. If they’re partly hollow, we want the hollow side facing up, so they don’t rise back to the surface. Having the pieces floating, like on the picture here, will be much less effective. 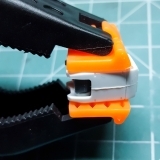 If you don’t have too many parts to strip, you can actually use a smaller plastic container. Put the parts in it, pour the IPA, then put the container into the ultrasonic cleaner and fill it with water. It’ll save you a fair bit of alcohol in the long run, if you’re only stripping few parts at a time. We then turn on the cleaner and let it do its magic. As you can see, couple minutes in, the IPA is already removing a fair bit of Mr.Color paint. Here we go – after 30 minutes most of the paint is gone. If there’s some paint left in the corners etc, you can quickly remove it with a toothbrush dipped in IPA. 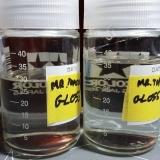 Ultrasonic cleaner works best when removing paint from multiple parts at once. 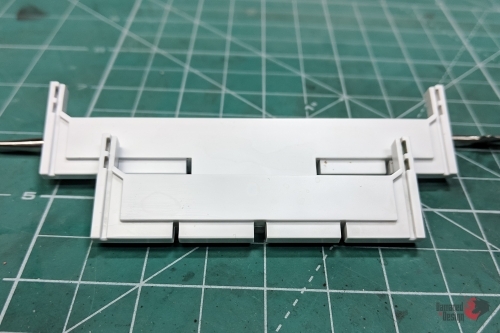 Not only we’ll save a lot of time, but pieces rubbing against each other will make the process much more effective. 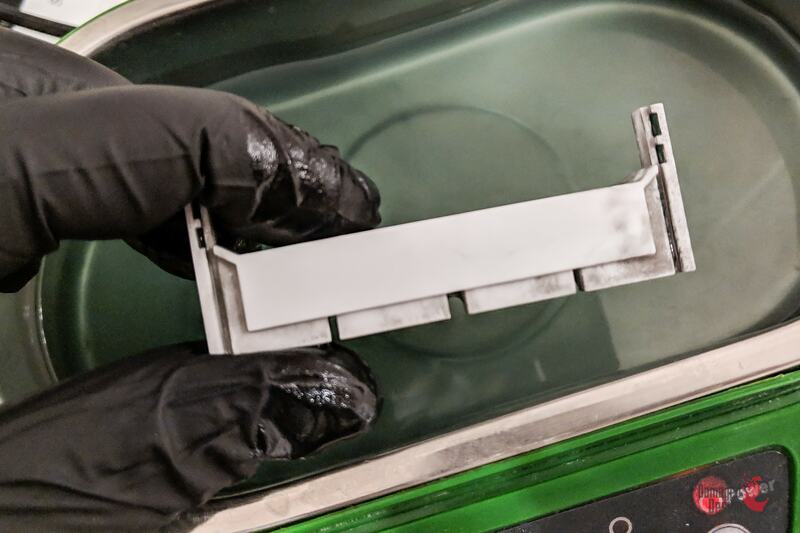 If you don’t have access to ultrasonic cleaner, fear not. You can still easily strip paint, it’ll just require more work on your part. All we need is a bowl or another container and a toothbrush. Using a stiff brush works too. Like before, we fill the container with IPA, enough to cover all the parts. As you can see, it’ll start working within seconds, but I like to let it soak for a while. 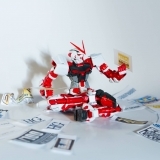 To speed up the process you can poke the parts with a toothbrush every now and then. After about 10 minutes we can start working the parts. 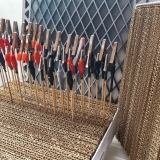 Simply start rubbing them with the toothbrush, applying some pressure to the piece. Most of the paint should be gone after just a few passes. If you’re in a hurry, you can actually skip the soaking and start brushing the paint off right away. It’ll require some more work, but overall should be faster. Old, stiff brush works just as well, especially for smaller, delicate pieces – V-fins and such. 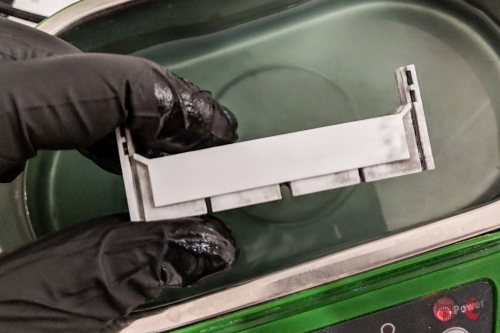 Obviously it’s nowhere near as efficient as using the ultrasonic cleaner, but it’ll work just as good in a pinch. And here we go, the parts stripped to bare plastic. Once all the paint is gone, make sure to wash them in clean water and give them a quick wipe with a paper towel. 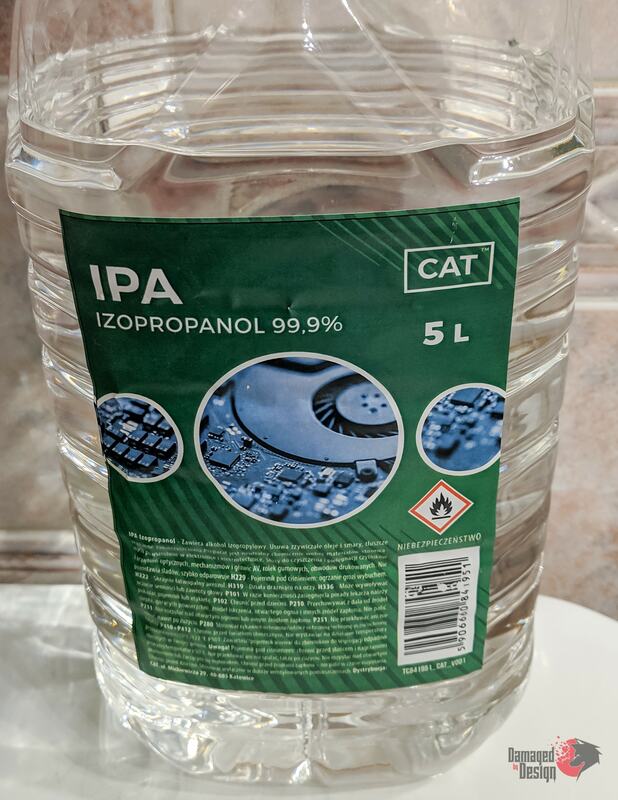 Isopropyl alcohol tends to leave some residue on the surface as it dries, so it’s always a good idea to wash off the leftover IPA. 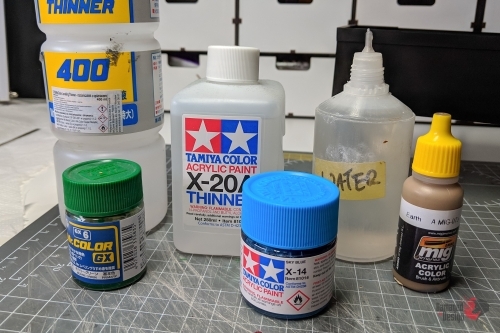 One thing I need to mention – since IPA dissolves lacquer paints, it’ll also remove any kind of lacquer-based putty you might’ve used on your kit. 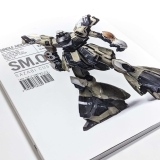 This includes Tamiya Basic, Tamiya White, Mr.Dissolved Putty and all other products of this type. It’s one of the reasons I stopped using them pretty much completely (in addition to shrinking and consistency not matching plastic), especially as gap fillers. Alright, so we covered stripping the acrylic paints, but what about enamels? Well, this is where things get tricky. There are two main problems with enamels. 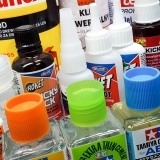 First off – enamel thinners destroy plastic, so we can’t soak them like we can acrylics without ruining the parts. Secondly, as I’ve written in my Paint Types tutorial, they undergo a chemical curing process, which turns them a hard shell around the piece. This takes some time, so for about a week, maybe two, we can still wipe them off using a sponge or a q-tip dipped in lighter fluid. Even so, it’s hard to get into all the corners and panels to properly wipe off the paint. And once they’re cured, the only thing we can do is sand the paint down. Long, tedious process that will likely ruin some details. My advice? Aside from specific techniques, like reverse wash, don’t spray enamels. Just don’t. 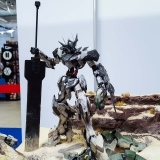 They don’t provide any advantage over using acrylics (including lacquers), while having a whole lot of drawbacks. 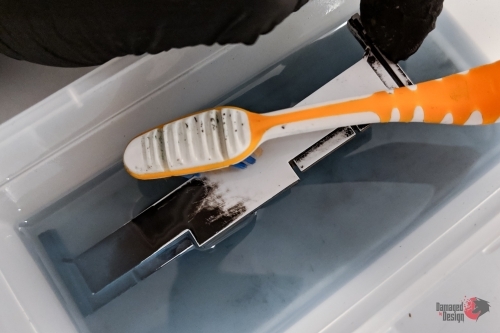 They’re very harmful when atomized, take much longer to dry, slowing you down and risking having dust stuck to the surface, as well as being much more difficult to completely remove if needed. Anyway, this is it for stripping paint. Hopefully you’ll find this tutorial helpful. Feel free to poke me on Facebook if you have any questions!